The opening from the infield is located by the front stretch pit exit.You may have to drive on the grass in the infield to reach infield exit.This grass has the same grip as the road. There are currently no setups for Myrtle Beach Speedway. Add a Setup. guessing none of the download links work anymore for this track..... I miss running on this one for sure. Lol is that the same version as Nascar Racing 3??? If it is props cause that game is great and I'll use this when I get the game. Could you do Galseburg, Toledo, and Berlin Raceway Robo19's track. Wouldnt mine the paved eldora to lol. Need some more short tacks for my midget league. Thanks Griff. I appreciate the kind words. I have someone that could possibly take on this task and will be in touch. Alleydog, I could only get 20 stalls on the front stretch pit lane.The others could be added to the back stretch pit lane I suppose.I would be glad to add the other pit stalls.I am new to modding and a little slow as I am still learning the basics.If you have the time and wish to do it, please help yourself. 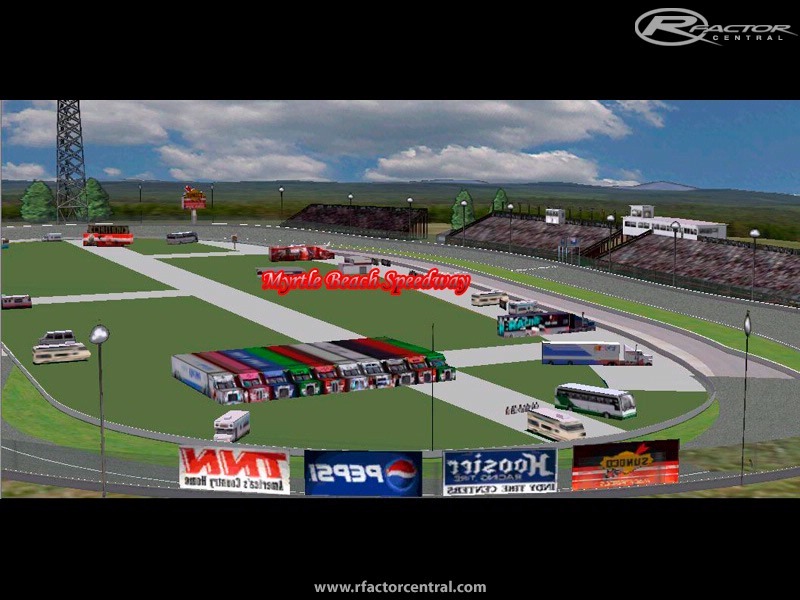 You guys have done a fantastic job with the NSS mod.We use it in our league and we all agree it's the best.Thanks for making rfactor "stock car" friendly. Griff, how many working pit stalls are there? It looks like the AIW file shows 20. I am the lead modder for NSS and would love to be able for the leagues that use the Camping World Truck Series to use this track. Problem is we have over 20 drivers. 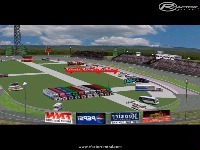 Can you confirm and would you be willing to add some pit stalls and pit stall line markers? If not I understand, just thought this track would be an excellent option for this series. Thanks! Thanks a lot Redwings20. That is in fact exactly what I was looking for. Now just need to see which track fits which power level of cars. I´m not an oval circuit fan , but to me anyone who shares his own work deserves respect and gratitude. Thank you Griff , nice track ! Ovals offer a close form of racing which is sometimes difficult to replicate in road racing where you often find yourself running alone against the track. Oval racing puts you constantly around somebody fighting for every inch of the track. Setups are an art form and you are constantly trying to achieve a perfection which may or may not exist. Regardless you have to create that delicate balance and put the car on edge. It is not for everyone but a lot of people enjoy it. Personally, I think Indy Cars offer some of the most intense racing around. They run both, but their oval stuff tends to be more exciting. 200 mph wheel to wheel. You just can't get that on a road course. Thanks, that was helpfull. Anybody else want to join for the free bashing ? Seems that I will stick to racetracks that I understand the appeal for now.